Submission for the 2015 PoonVlix Repro Weapons. Made of semi-pliable plastic but still more rigid than originals and would probably snap if bent too far. Solid Black in color with no translucent qualities. Both sink in water. Thanks for the pics and info. Is it okay to add these to the Gunnery website? Looks like a brand new sculpt compared to his previous one which was not as long as an original. I'm still waiting for mine, apparently it landed at heathrow airport a few days ago so I shouldn't have long to which to compare it side by side with an original vlix rifle. As a founding contributor, anything I post can be used for the Gunnery. 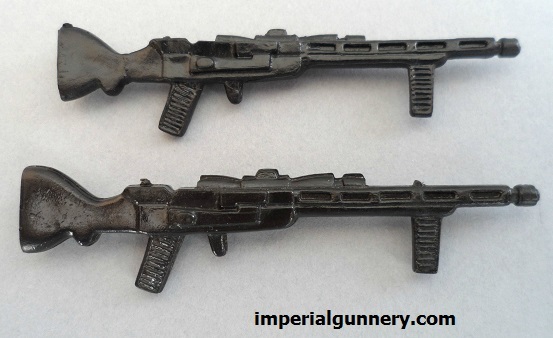 Here's a comparison shot of the Version 1 and Version 2 PoonVlix Glasslite repro rifles.